Leaked: OS 5.0.0.230 for the BlackBerry Curve 8330!! Wow. Now this is pretty huge. We've been wondering what the cut off was for OS 5.0... in other words, which existing BlackBerry Smartphone models would see the upgrade. First we had heard that devices with less than 128 megs of flash memory wouldn't get 5.0. Then we heard the real cut off was OS 4.6: Devices running 4.6 or higher would get 5.0, while those with less than 5.0 wouldn't get it. Whichever reason, it meant bad news for BlackBerry Curve 83xx series owners (exception - 8350i??). 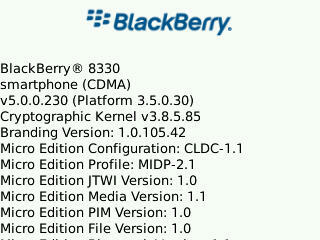 But look what leaked today - OS 5.0.0.230 for the BlackBerry Curve 8330. If you have one and want to be a risktaker, give it a go and let us know how it works! We're still not certain this will get rolled out officially by carriers, but at least it exists!